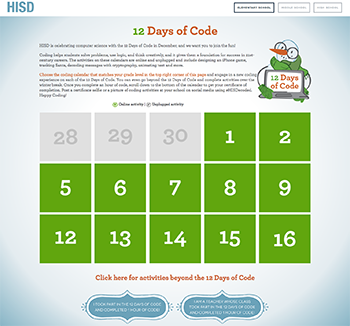 HISD is inviting all students to celebrate the 12 Days of Code in December with interactive calendars that allow them to engage in a new coding experience every day. Coding helps students solve problems, use logic, and think creatively, and it gives them a foundation for success in 21st century careers. The activities on these three calendars – for elementary, middle, and high school – include designing an iPhone game, tracking Santa, decoding messages with cryptography, animating text, and more. 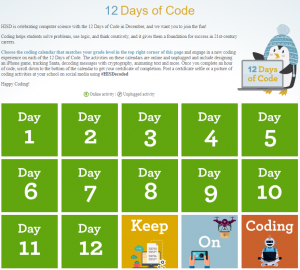 Students can even go beyond the 12 Days of Code and complete activities over the winter break. This entry was posted in News and tagged 12 Days of Code, computer science, Hour of Code on November 28, 2016 by HISD Communications.